My hopes were set high with this game, from the first moment I heard comic book superstar Joe Madureira had been drafted to the project. Joe Mad!, as he is known, is a legend for his comic work on X-men, Battle Chasers and most recently Ultimates 3, and it has earned him quite a fan following. The trailer for this game is one of my favorites to date and had me purchasing Darksiders on day one. In fact, I had even stood in line for a signing with Joe Mad! at Big Apple Comic Con and got to play an earlier demo of the game, but more on that later. This is an action RPG game of a fairly high caliber. Slick, post-apocalyptic graphics featuring different gods doing battle for the fate of the world always warrants some attention. The graphics and design, you'll see, are the game's saving grace. 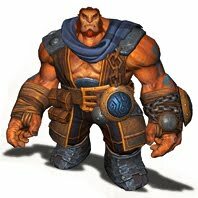 The storyline is intriguing; you play as War, one of the four horsemen of the apocalypse, on his quest to find out who prematurely triggered the apocalypse.You start the game and the apocolyspe is already well under way; unfortunately, this is without War's knowledge or his doing. You seek out the demon, Samael and War engage in an awkward alliance. Samael tells you that you can regain your former strength by fighting across the crumbling cities and wastelands of the now destroyed civilization of man. Along the way you build up War back to his original horseman's strength in order to tackle the big bad behind the premature apocolyspe. As mentioned, the graphics and character design are all based on the work of Joe Mad! - the result is a stunning looking game. Everything from the colors to the life-like shadows really evoke a feeling, that this is a world that could be, and you actually want to save it. The demons and angels and other character designs are very large, detailed and modern. The weapons design is just as intricate as the characters and in action, they cause massive devastation. Ruin, War's steed, is especially well done and once unlocked can be summoned, in a flash of black smoke, to anywhere War is. It's too bad that almost right away you'll notice that you've played this game before. 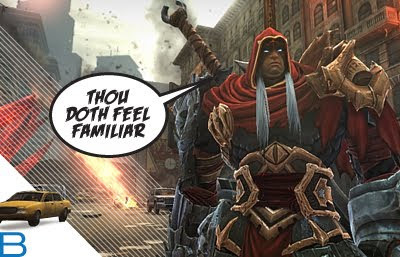 Darksiders "borrows" gameplay from about 5 different hit games. The overused and often-copied Zelda formula is the basis for the "explore, then fight in the dungeon and defeat the boss" level design. There are also bombs and even a hookshot type items for traversing terrain and solving puzzles. 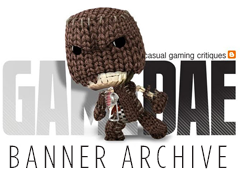 Other "nods" are to: Portal, God of War, and a couple of other shooters. This game came with some goodies. In the box was a weapon download code for a scythe, called the Harvester. Another code in the box was clearly marked: do not discard. Interestingly a few months after the release this turned out to be worth a free game from THQ. What came in the mail was the disk based game, Red Faction: Guerrilla and a disk featuring the Darksiders Hellbook, addition game art and Darksiders.com website content. This is the first time I've heard of a free disk-based game giveaway. I'm taking these freebies into account in my grading. Despite some of its short comings and copied gameplay, I still love this game. It can be a lot of fun. There are some levels I would have cut, namely the entire spider level. Riding your horse, Ruin, is a thrill and the summoning graphics are a nice touch. All and all I'm in it for the well done graphics and the story but if I really wanted to play Zelda I would have. When I met Joe Mad! at the Big Apple Comic Con I received a Darksiders T-Shirt for being one of the first in line. In honor of this post, I will send this T-shirt to the person who leaves my favorite comment. So, try to stay on topic, give me your assessment of the game or just be really, really funny. If you win, I'll email you to obtain your mailing address so I can send you the shirt. Restricted to the US but feel free to comment anyway. 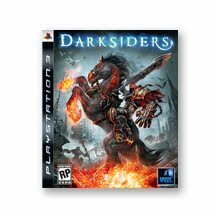 Congrats to Jon who only bought Darksiders because he thought it had to do with the Sith listening to Pink Floyd. You win a shirt, wear it well brother. 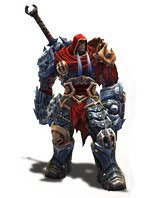 Wake me back up when they make a Battle Chasers game, or heck, even the next issue.